Child Holocaust survivor uncovers a piece of his family history. 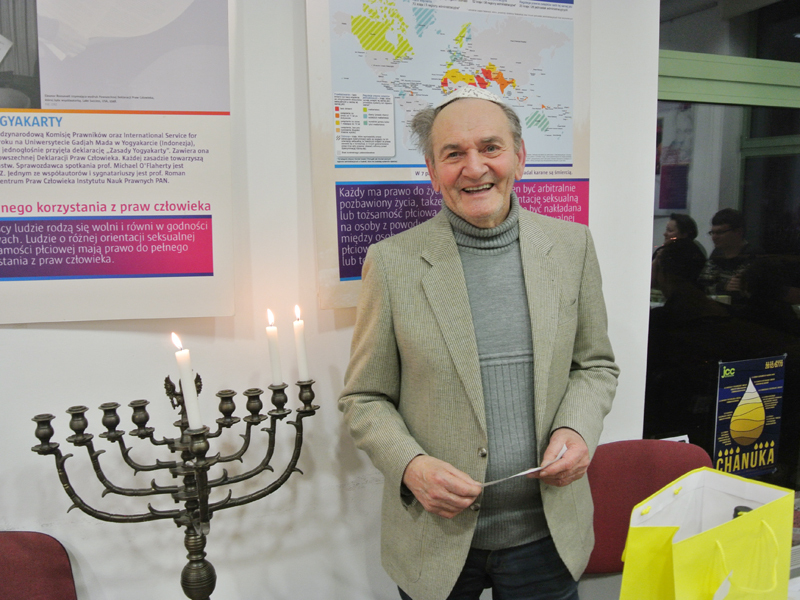 At 86 years old, Emanuel Elbinger (who is better known as Mundek) is an active member of the JDC-supported Jewish Community Centre in Krakow, Poland. What Mundek did not fully realize until recently is how closely his own life has been linked to JDC. On the eve of World War II, eight-year-old Emanuel, together with his parents and two sisters lived in Brzesko Nowe, a town near Krakow. When the Germans created a ghetto and proceeded with their anti-Jewish policies, the Elbingers knew they were in grave danger. Hearing rumors about an impending deportation in fall 1942, they went into hiding in the countryside. Emanuel Elbinger standing before a menorah at the JCC Krakow. Only Emanuel, his father, and sister (Paulina) survived. To regain their health, the siblings were placed in a Jewish children’s home in Zakopane, a town in the mountains of southern Poland. With JDC’s assistance, the young survivors received care, food, and schooling. By 1946, the children’s home was closed, and most of its charges had left for Palestine. But, upon the request of their father, who, due to his illness was unable to care for his children, Emanuel and his sister were placed in a children’s home in Krakow. Emanuel attended a Jewish day school, and later an ORT course. In time, he built a life for himself in Krakow. 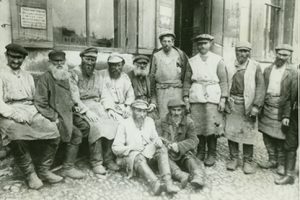 Over the years, Mundek travelled to Belgium to visit his maternal relatives. While he knew of his father’s plans to emigrate there after the war, he did not know that it was through JDC that his father had been making the arrangements. It was only recently, and thanks to the digitized records of the JDC Warsaw Office of 1945-1949, that Mundek learned this piece of his family history. 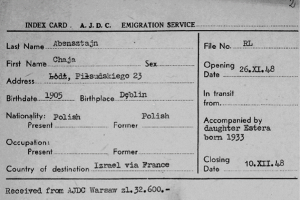 Undated index card from JDC’s Warsaw Emigration Service featuring the Elbinger family. 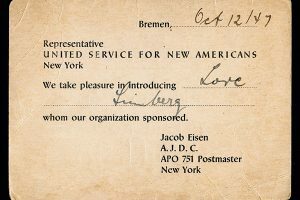 Mundek found out that in September 1948, William Bein, the JDC Director for Poland, sent a letter to the JDC Brussels office requesting special assistance to the Elbinger family. Mundek’s maternal aunt, together with her child, had already been living in Belgium, and the plan was for her to marry Mundek’s father and raise their children together. 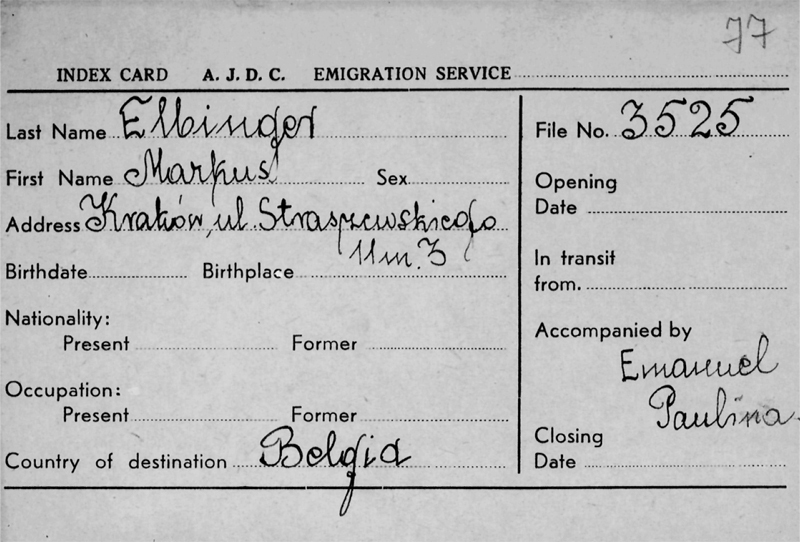 An undated index card from JDC’s Warsaw Emigration Service shows that the Elbinger family of three was ready to leave Poland. However, the father’s illness, and later his death, halted the emigration process. The documents that Mundek discovered in the JDC Archives were invaluable. After so many years, he learned a new detail about his family’s postwar efforts to rebuild their lives, and he gained a better understanding of the role that JDC has played in his own life.